People cool off on a beach in Qingdao, in eastern China, August 11, 2013. China has experienced its hottest August for more than half a century, weather authorities said, after a summer heatwave that saw meat cooked on pavements. China has experienced its hottest August for more than half a century, weather authorities said, after a summer heatwave that saw meat cooked on pavements. A map on the website of the China Meteorological Administration (CMA) shows large parts of central and eastern China, and the western province of Xinjiang, had average daily maximum temperatures of more than 40 degrees Celsius (104 degrees Fahrenheit) between July 31 and August 29. 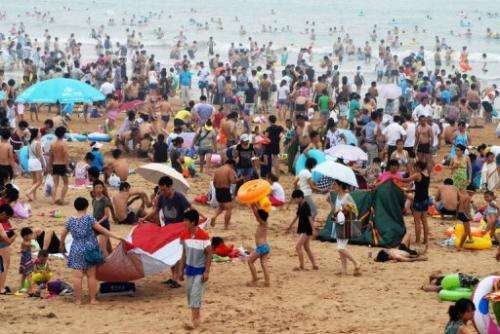 The highest temperature recorded was in Xinchang, in the coastal province of Zhejiang, where the mercury reached 44.1 degrees on August 11. The average national temperature over the period was 22.3 degrees Celsius, the CMA said—the highest since it began compiling records in 1961 and 1.3 degrees higher than average. Average national rainfall was 89.5 millimetres, 7.3 percent below normal, it added. The figures come after much of the country was gripped by a heatwave, with at least 10 people dying of heatstroke in Shanghai. At the time pictures showed people sheltering from the heat in air-conditioned shops or subways, and trying to cool off in swimming pools and rivers. Footage of a slice of pork cooked through in 10 minutes on an outdoor stone slab, taken by a Shanghai TV station, went viral online. "It turns out that the only difference between me and roast meat is a pinch of cumin," joked one user on China's Twitter-like Sina Weibo.